Twilight of American Sanity and The Dangerous Case of Donald Trump, reviewed. Two new books set out to assess Trump’s mental health and end up with equally terrifying but totally opposite results. Photo illustration by Natalie Matthews-Ramo. Photo by Win McNamee/Getty Images. Ever since Donald Trump descended that escalator in his Fifth Avenue skyscraper, the media has been obsessed with adjudicating his mental health. During the campaign, we speculated over whether he was a sociopath or a narcissist or a psychopath, and we debated whether psychiatrists could even ethically issue warnings pertaining to the hypothetical pathologies of a presidential candidate. Since the election, we’ve moved on to arguing about whether his perceived insanity is enough to justify removing him from office, with writers like the New Yorker’s Evan Osnos and the New York Times’ Ross Douthat assessing the 25th Amendment as a possible means. Journalists are reflecting the concerns of a worried public—56 percent of the population says he’s unfit to serve, and even senators have been caught on tape describing him as “crazy.” The continuous litigation of whether Trump is crazy and whether it matters has become a drumbeat of life today, perhaps because answering these questions could help us figure out what has happened to our country and how we might get out of our predicament. In the past few months alone, two books have been published that attempt to investigate Trump’s sanity at full length. One, Twilight of American Sanity: A Psychiatrist Analyzes the Age of Trump, is written by Allen Frances, the psychiatrist who wrote the criteria for diagnosing narcissistic personality disorder. It maintains the position Frances took earlier this year in a viral letter to the editor of the New York Times: that Trump is not nuts, or at least not meaningfully so; he is simply the product of a society gone mad. The other book, The Dangerous Case of Donald Trump, is an anthology of essays primarily written by mental health professionals following a Yale conference about the “duty to warn”—the idea that mental health professionals are obligated to speak up when someone’s mental illness threatens the safety of others. These essays argue all kinds of things, but primarily they assert that not only is Trump crazy, he is dangerous and making the rest of us crazy, too. When Frances wrote his viral letter to the editor, we were just three weeks into the Trump presidency, and I found his sharply worded denouncement of the idea of diagnosing Trump to be extraordinarily comforting, in a nihilistic sort of way. “His psychological motivations are too obvious to be interesting, and analyzing them will not halt his headlong power grab,” Frances wrote in his letter, “The antidote to a dystopic Trumpean dark age is political, not psychological.” This fell in line with a lurking suspicion I had about the way commentary in the Trump age would play out—that we would focus too much effort on the man rather than the society that empowered him and that in doing so, we might grapple with our immediate problems but fail to address our larger ones. And it was a relief to hear an expert—the expert—clarify this; it felt like an adult in the room reminding me that even though the world felt upside down, the sky was still blue and political action, the same boring answer we were always faced with, was still the appropriate, perhaps only, response. I went into Frances’ book assuming I would find more comfort—not in the everything-is-going-to-be-all-right sense but in the Frances-is-an-adult-in-the-room sense. I did not find much comfort at all, though. The problem with Frances’ analysis of the age of Trump is that it is not really about the age of Trump. It’s clear throughout the book, and Frances admits as much, that this is a text written before Trump’s election that then was retrofitted to include Trump. He reiterates the points in his letter to the editor but doesn’t expand on them in meaningful ways—instead he focuses his book on what he sees as society’s main problems. It is occasionally reassuring to hear someone else lament that we, as a society, have ignored long-term problems—climate change, overpopulation, declining resources, overconsumption—in the service of immediate satisfaction, and that this shortsightedness will likely eventually cause our demise. But you’d expect a self-appointed wise elder—Frances, born around the same time as Trump (and also in Queens) notes that part of what propelled him to write the book was concern for the problems his generation is leaving to its children and grandchildren—to have some clarifying understanding of these problems, if not full-on answers, and that’s where Frances falls short. He is at his best when he applies his psychiatric expertise to diagnosing and understanding our mass affliction: that humans are uniquely suited to understand the bigger, longer-term picture, but we are all still saddled by the slow-evolving impulses that force us to prioritize the short term. He is at his worst when he dips into problems that others have been covering much more comprehensively for years, like the health care system and natural resource depletion, and unfortunately the book is skewed toward the latter. He offers tips for dealing with a delusional patient, including practicing empathy, instilling hope, and relying more heavily on metaphors than on facts, but while this is all interesting, it is hard to imagine how applying such tips to society at large will yield a meaningful result, particularly given that such strategies have already been used to minimal effect. (Republicans aren’t going to start believing in climate change because we’re nicer in our discussions of it.) Ultimately, his sketch of society is depressing and obvious, and his proposed solutions feel themselves like a form of, well, delusion. As blunt-force as its title and framing might be, The Dangerous Case of Donald Trump is the far more surprising and interesting text of the two, though there is not much comfort here, either. Perhaps the book’s greatest contribution is that it could help end the endless discussion of the Goldwater rule, an ethical mandate from the American Psychiatric Association that restrains psychiatrists from diagnosing individuals they have not yet examined. Dangerous Case makes a compelling argument for why this otherwise legitimate rule should not apply when the subject at hand is a person who holds the literal power to end the world and reframes the ethical debate around what it might mean to watch this and not speak up. The forward to the book is written by Robert Jay Lifton, renowned for his work on how societies function under extreme stress. In his studies of Vietnam veterans and Nazi doctors, Lifton has conceived of the idea of “malignant normality,” a situation in which previously unthinkable actions are justified as normal and necessary, allowing society to metastasize in previously unthinkable ways. His essay makes all of our initial efforts not to normalize Trump—remember how incessant the warnings about this used to be?—feel remarkably insufficient. One fascinating aspect of this book is how it serves as a time capsule; the deadline for contributions clearly fell soon after the firing of James Comey, and the outrage the writers convey in response to that then-recent event feels quaint on the other side of so many more outrageous choices made by Trump in the months since. Remembering how unusual this scandal was and how many times it has been at least met if not surpassed since is perhaps the best way to understand our age of malignant normalcy. Of course, just because Trump appears plagued by mental illness does not mean he is unfit to serve as president—past presidents have experienced forms of mental illness, and perfect mental health should not necessarily be a requirement of the office. The more relevant line of inquiry is what causes his pathologies, which could illuminate how they might be affecting his ability to serve (though of course, having been democratically elected to the office, serve he will). We all know what Trump’s psychological foibles are at this point: He consistently views himself as a victim, he values dominance over everything, he is so consumed by his own internal struggle that he can never see the bigger picture. Mental health professionals are inclined to explain behavior through the lens of how a patient’s emotional needs dictate that behavior, i.e., Trump presents himself as victim because he chronically needs to escape blame or responsibility. If you envision Trump as someone enslaved by the task of ensuring his own psychological comfort at all costs, his actions become both more understandable and more frightening—Trump’s reactions are not calculated malice but impulsivity, making them seem trickier to reign in. As Tony Schwartz, co-author of The Art of the Deal, writes in the essay he contributed to the anthology, “On the face of it, Trump has more opportunities now to feel significant and accomplished than almost any other human being on the planet. But that’s like saying a heroin addict has his problems licked once he has free and continuous access to the drug. Trump also now has a far bigger and more public stage on which to fail and to feel unworthy.” We are all now living inside the absurdity generated by one man’s extraordinary attempts to evade reality. All of this analysis is alarming, but very little of it is new. The book is divided into three sections, first parsing the “Trump phenomenon,” assessing who he is and what is wrong with him; then the “Trump dilemma,” namely how the things wrong with him might manifest as dangers to society and how those dangers might be avoided; and finally the “Trump effect,” which seeks to understand how Trump is changing all of us. What feels more urgent than plumbing Trump’s psyche is understanding the question of how we arrived here, what it is doing to us, and how we might get out (of the conditions that gave us Trump, more than Trump’s presidency itself). It is in this last section that the book feels most useful—not because it offers a 25th Amendment–like path for escape, but because in taking the time to explain the forces surrounding Trump, it imparts some smaller, but more specific lessons. A particularly excellent essay from Betty Teng finally puts a finger on why we all, or at least many liberals, feel so freaked out so much of the time—we are still living in the midst of complete crisis, she writes, and given that we have no idea when it will end, we cannot even begin to process and move on from this uneasy state. Not particularly comforting, but certainly practical. 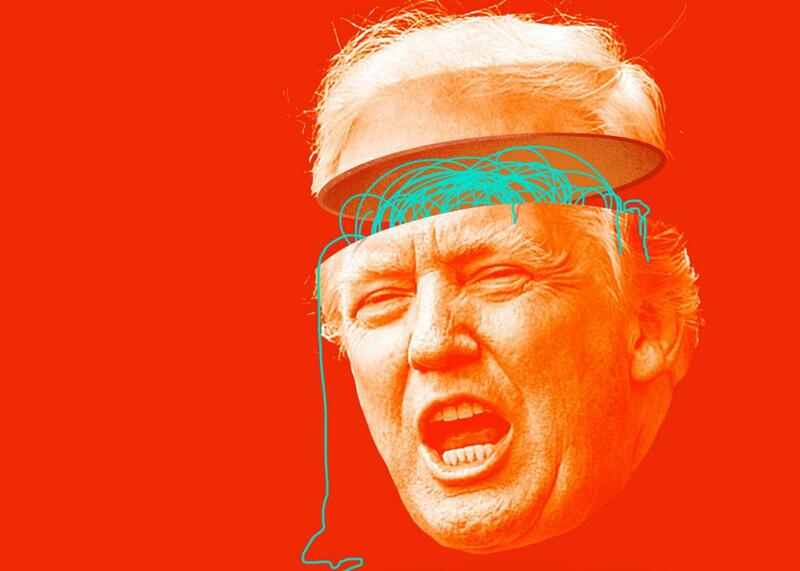 One peculiarity of the Trump age is that many of us find ourselves looking for “adults” everywhere: in the White House and in Congress of course, but also in our late-night TV hosts, judges, journalists, and, apparently, psychiatrists. But in entering any world of professional expertise, you are much more likely to find more complicated questions than simple answers. There is no obvious agreement between psychiatrists about what is wrong with Trump, or what we could do to solve it. These books, even while trying to give us answers, acknowledge the lack of apparent solutions—that a diagnosis does not mean there’s an obvious treatment plan, that being aware of deficiencies in someone’s mental health does not mean you know how to fix them, that “fitness” is something we may all strive toward but many of us will have to settle for “functional.” This is true of our society’s psyche, too. Wish as we might for sanity, there is no guarantee that we will get it. The adults in the room may offer up comfort, but they don’t have the solution. That part is still, maddeningly, up to all of us.